The beautiful inspiring flag that waves over Texas today was created and officially dedicated only after a score of other flags had first been the banners under which Texans so valiantly fought for freedom. Santa Anna once scornfully said, “The Texans flatter themselves, they have a government, and are fighting under no recognized flag”. At that time, Texas had many flags under which the brave and determined Texans soon conquered this self-styled Napoleon of the West, and within just a few months it had a government which has endured for five generations. 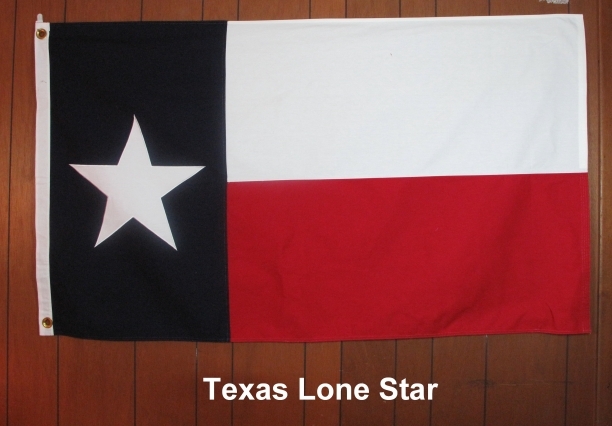 Texas soon had a permanent official flag-the Lone Star Flag- designed by Sen. William H. Wharton. The red, white, & blue flag, with a single star in its union of blue, was officially designated in 1839. 3'X5' Cotton, Cut & Sewn. Satisfaction guaranteed. Fully refundable within 10 days of receipt.